Interview w/ Jodi Benson, the voice of Ariel. I'd never seen "The Little Mermaid" before this re-release, if you can believe that, so pardon me while I gush for a moment. I love this movie. Ariel is adorable (although one has to wonder whom Disney was targeting with a movie about a curvy 16-year-old in a bikini). Ursula, the evil half-octopus, half-opera singer, is nothing short of delicious in her maliciousness. Prince Eric is your standard statuesque Disney dope, but what else is new? Sebastian the worry wart crab and Flounder the gullible guppy are classic comic relief. The songs are still stuck in my head three days later and the way Ariel's hair flowed in the water is still dancing across my retinas. It's no wonder this movie resurrected the 30-years-dead animated musical genre. In case there's anyone else out there like me who hasn't seen "The Little Mermaid," the story is about Ariel, the spirited, redheaded, love-sick teenage daughter of Triton, King of the Sea. She has a fascination with the surface-dwelling humans, but has been forbidden by daddy to kick around up there since humans are bad -- they eat fish. She does anyway of course, since Triton doesn't think to ground her, and daydreams constantly about life with legs. She falls in love with a human prince after rescuing him from a shipwreck and singing "Part of Your World" while he's semi-conscious, then slips back into the sea. She cuts a deal with the evil, magical sea witch Ursula to make her human for three days in exchange for her lovely voice (by Jodi Benson). But her voice was what Prince Eric fell in love with, so even when she catches up to him as a human, he's still pining for the girl with the voice, not knowing it's Ariel. 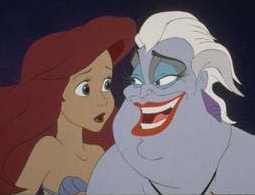 Meanwhile Ursula plots to take over the undersea kingdom and ruin Ariel's life. Adventure and happy endings ensue. One innocent hero(ine) with some kind of parental deficiency (one parent, no parents, absentee parents who are gods). One inherently evil, glowing-eyed and very amusing baddie. Comic relief from talking animal sidekicks who try to keep the hero(ine) out of trouble. One lavish production number involving synchronized dancing by inanimate objects. Doofus male lead who does a double-take when first seeing the sassy, but very girlie, female lead. Something supernatural saved for the last reel to rescue the hero(ine) or someone dear to him/her. Even so, this outline never worked better than in does in "Mermaid." It's fun and thrilling at once. With the unforgettable, Broadway-style music ("Under the Sea," "Kiss the Girl") by Alan Menken and the late Howard Ashman, and the spectacular animation -- especially of Ursula, the way her tentacles glide, the jiggle when she laughs that evil laugh -- it's no wonder this film is considered a classic when it's only eight years old. "The Little Mermaid" is the Disney animated fairy tale at it's absolute best.